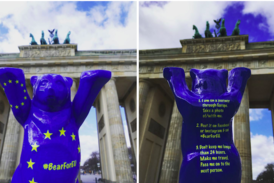 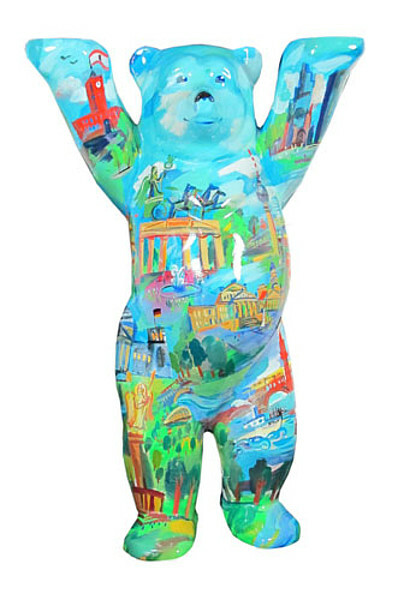 Under the patronage of Dame Marianne von Weizsäcker the big Buddy Bear auction took place on Tuesday, 15 November 2016, at the "Mercedes-Welt" at Salzufer in Berlin. Julia Theurkauf was the auctioneer that night. 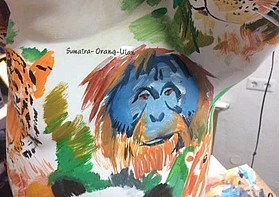 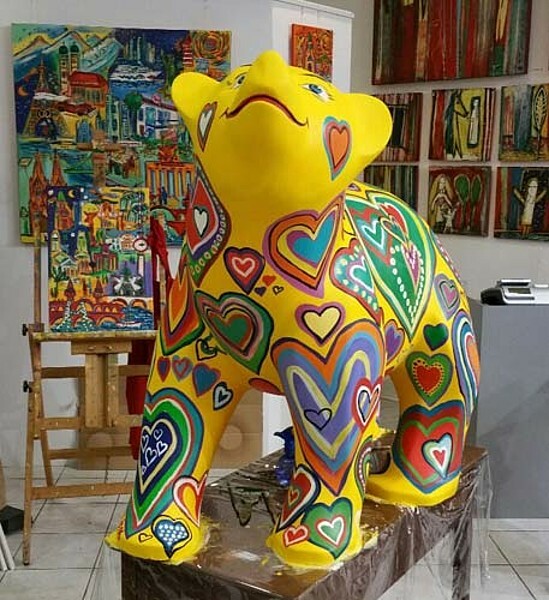 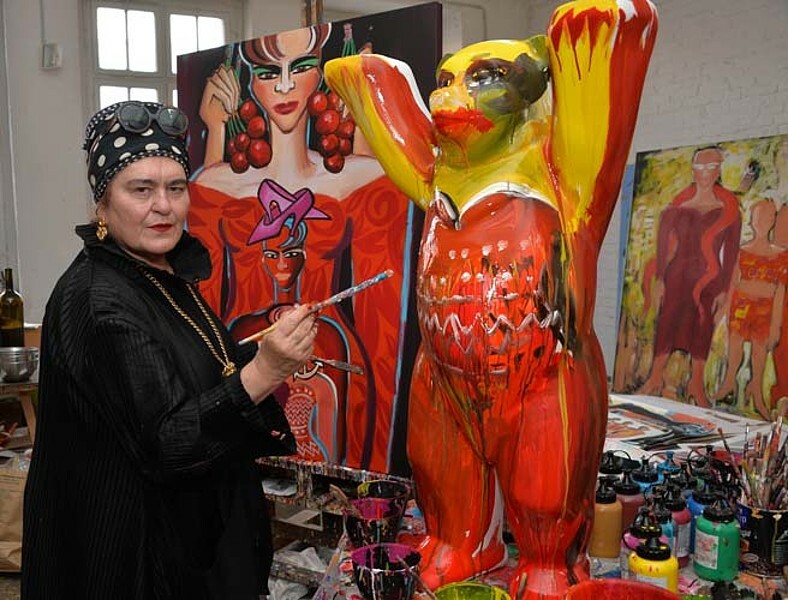 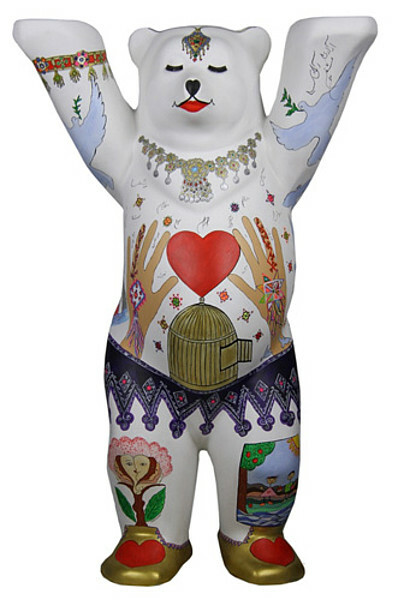 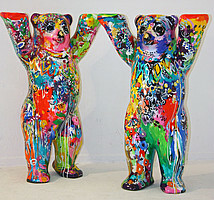 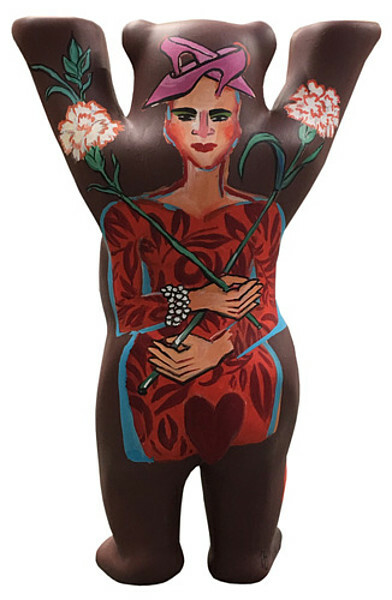 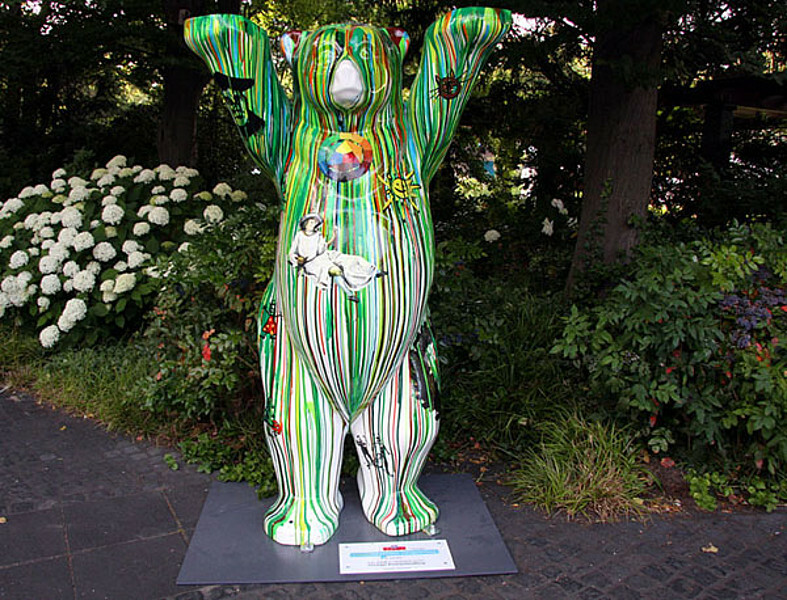 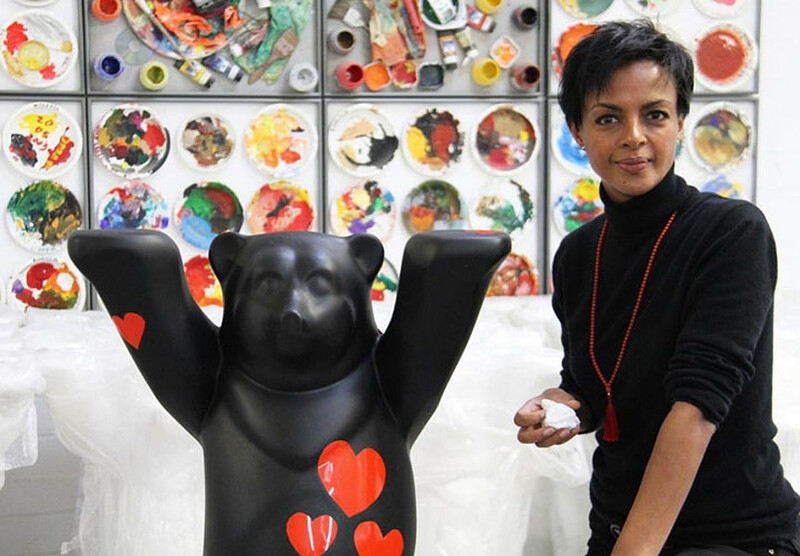 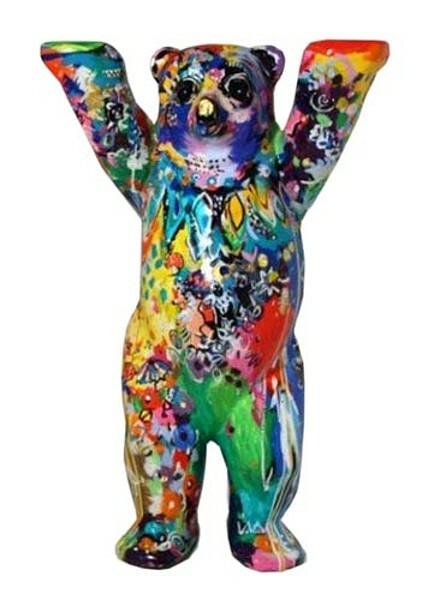 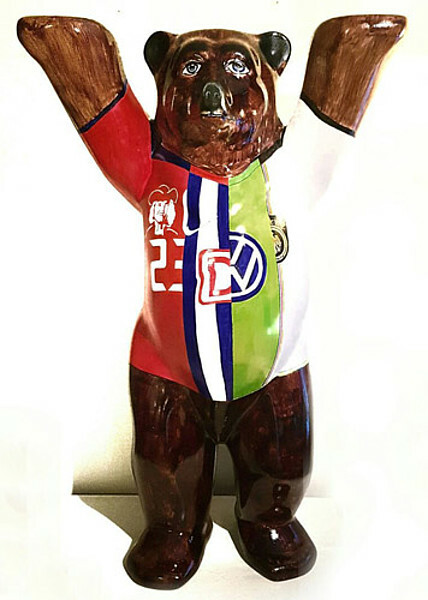 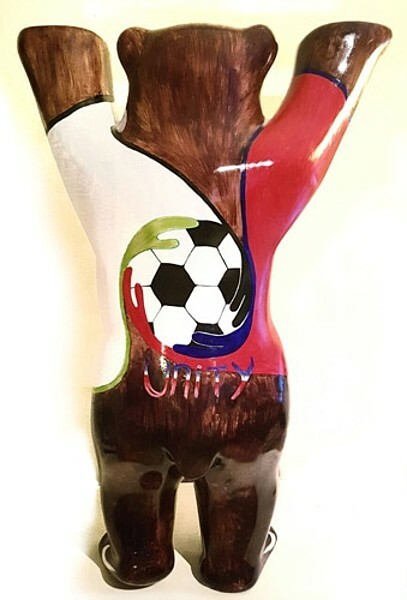 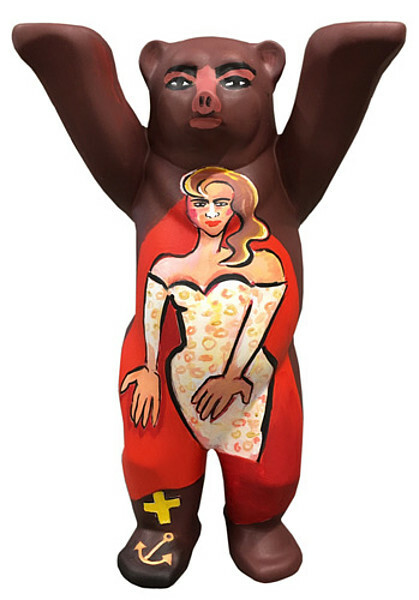 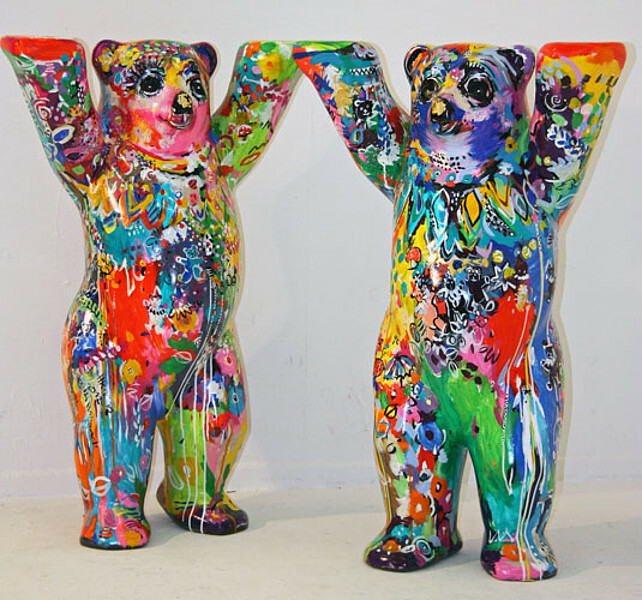 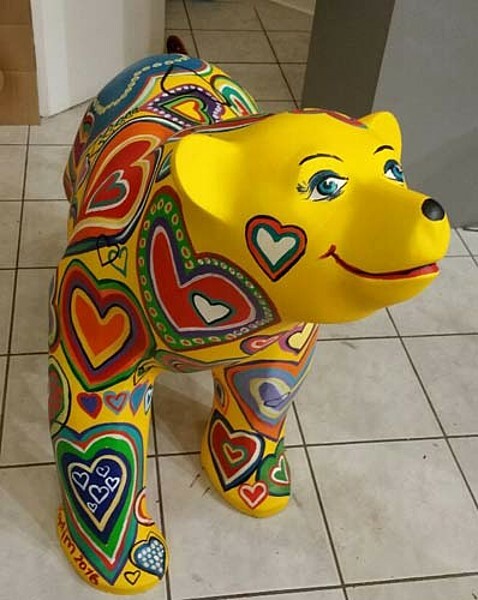 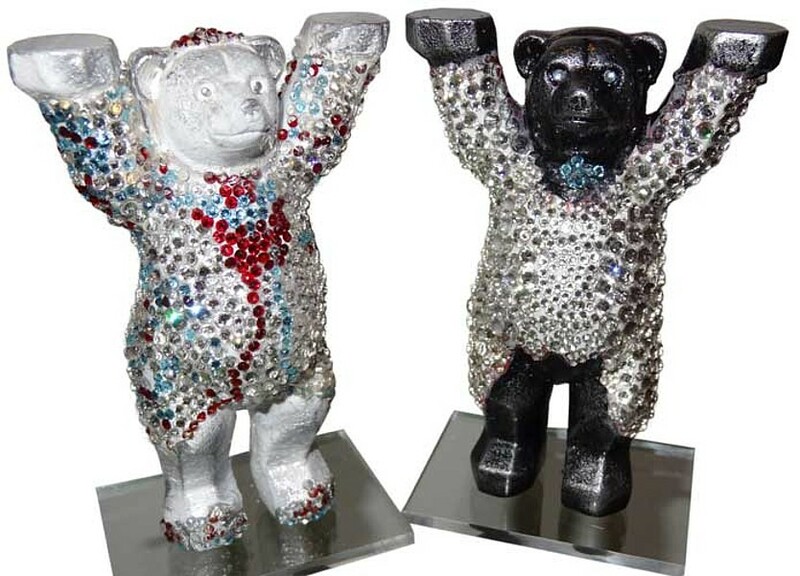 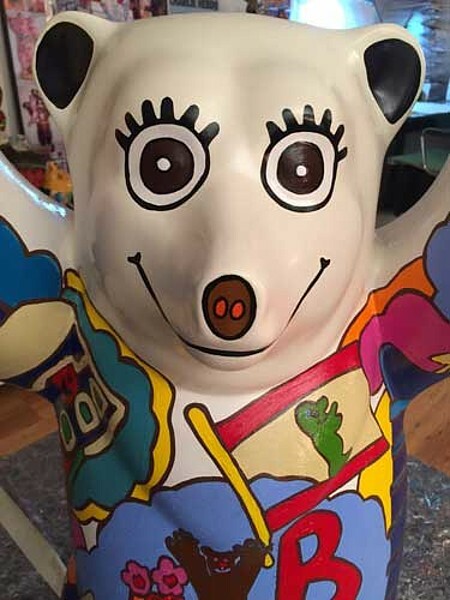 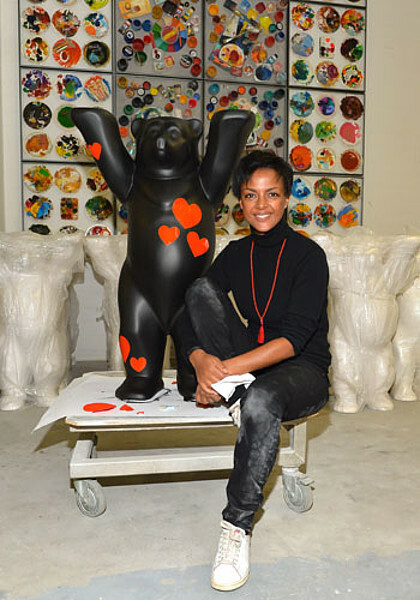 Renowned artists like Elvira Bach, Kani Alavi, Frank Rödel, and Sabeth Holland as well as celebrities like Dennenesch Zoudé, Zohre Esmaeli, and Nina Ruge had taken up the paintbrush for the good cause and designed Buddy Bears, which will be sold at the auction. 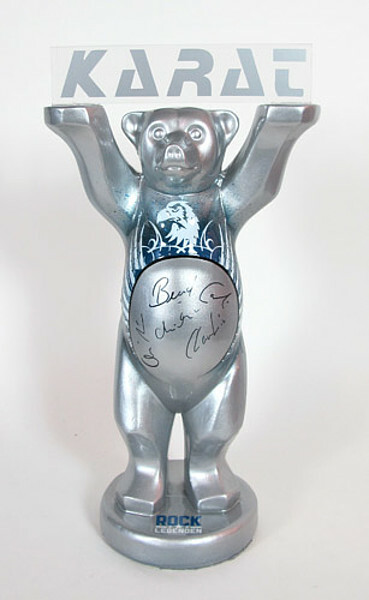 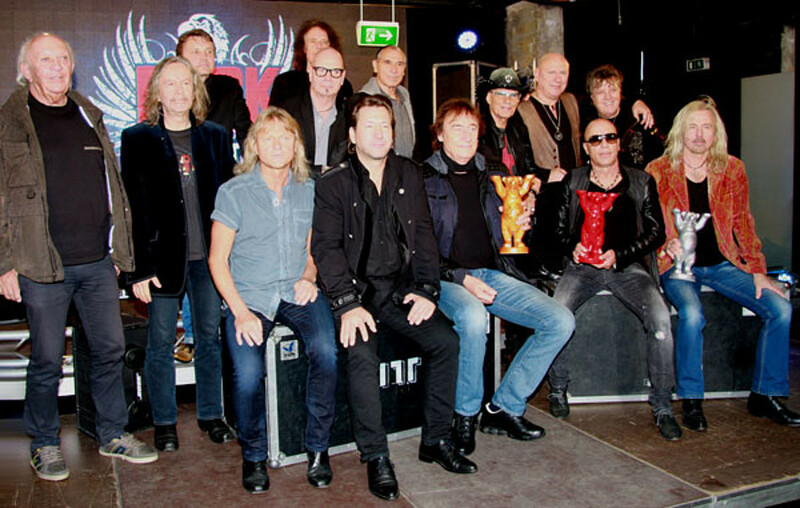 Other bears have been signed by rocklegends such as Karat, City and the band Puhdys. 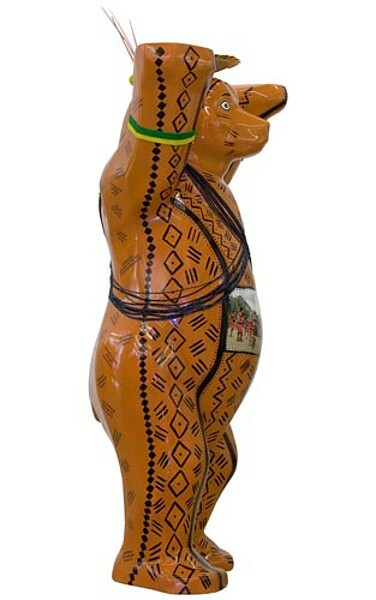 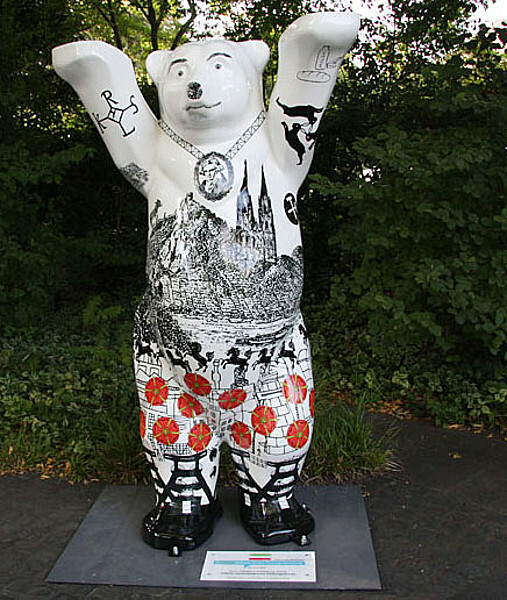 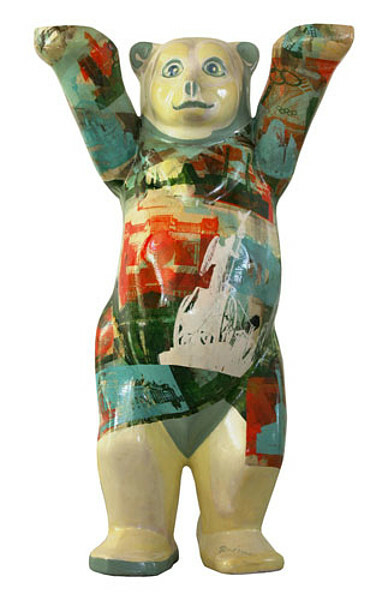 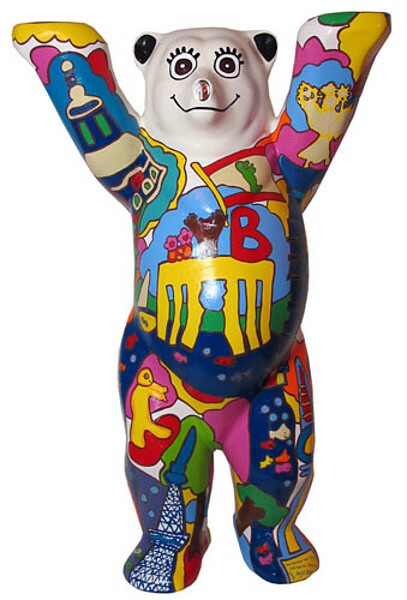 The proceeds of the 2m and 1 m tall unique items and the minatures of 33 cm benefited 100 percent organisations for children in need, such as UNICEF, SOS-Kinderdorf, DKJS, Bürgerstiftung Berlin, Menschen helfen!, Buddy Bear Help, Berliner helfen, and Stiftung Fairchance. 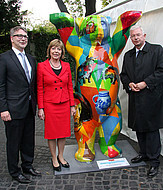 All costs of the event were taken over by sponsors or Buddy Bär Berlin GmbH. Proceeds of 107.250€ have been generated at the auction. 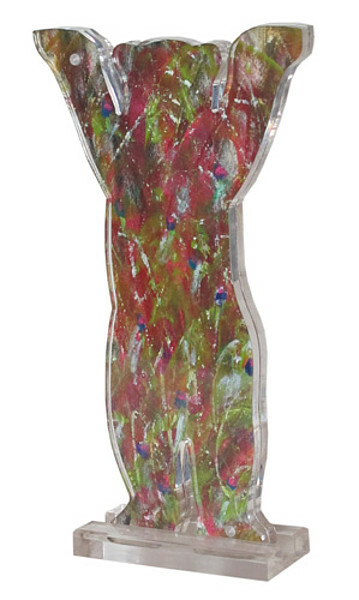 Click here for a short review. 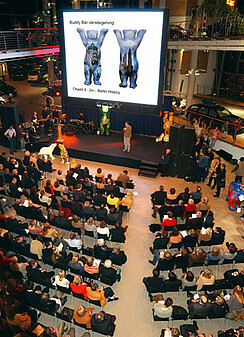 We would like to thank all bidders as well as our partners Mercedes-Benz, Weberbank and Haberling. The auction was supervised by SEVERIN Rechtsanwälte Partnerschaft mbB. 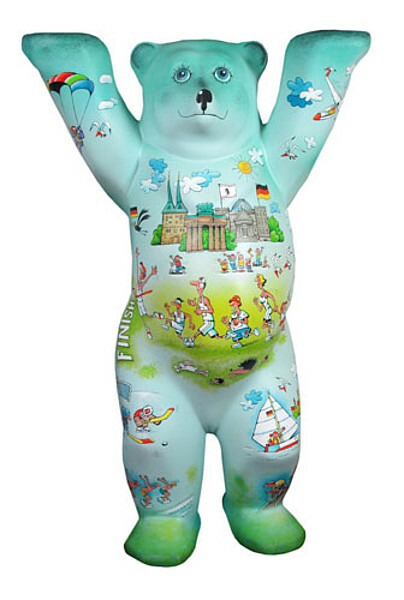 The lowest bid for a 2m tall Buddy Bear was 2.200 €. 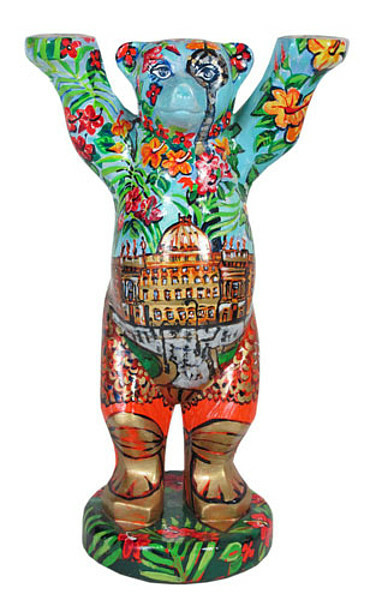 Object 2m - 1 "Metropolewerden"
This bear was shown at the exhibitions in Berlin, Vienna, Cairo, Jerusalem, Warsaw, Stuttgart, Pyongyang, Buenos Aires, Montevideo, Astana, Helsinki, and Sofia. 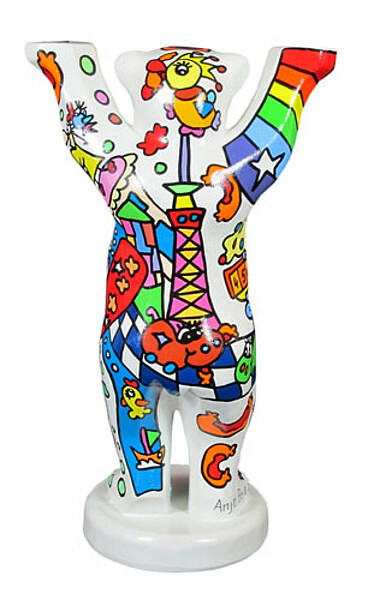 The proceeds go to UNICEF. 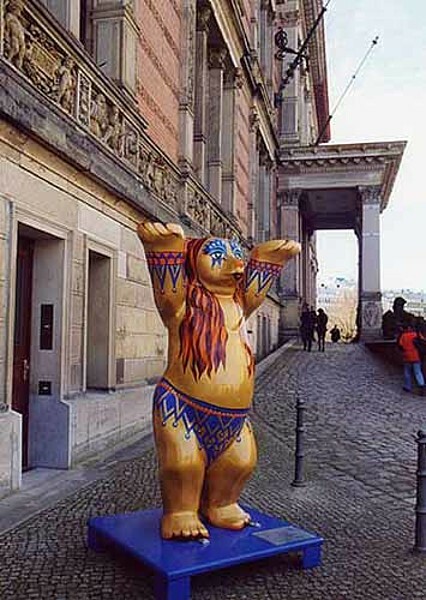 Object 2m - 2 "Zauber des Orients"
This bear was shown at the exhibitions in Berlin, Vienna, Cairo, Jerusalem, Warsaw, Stuttgart, Buenos Aires, Montevideo, Astana, Helsinki, and Sofia. 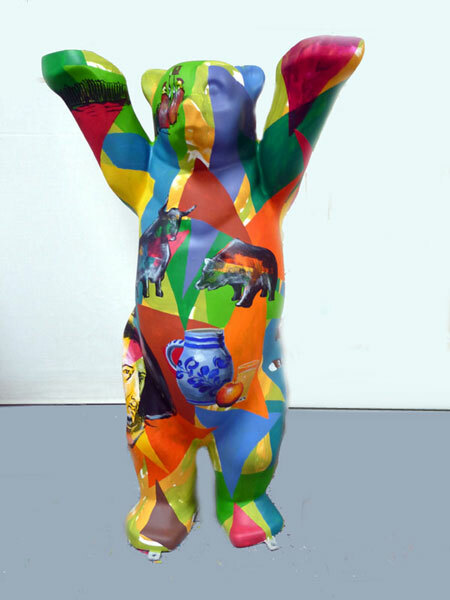 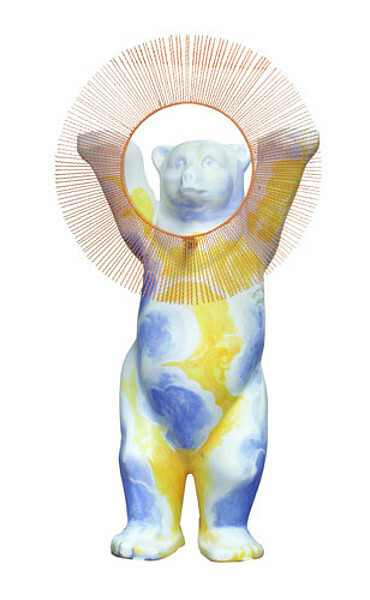 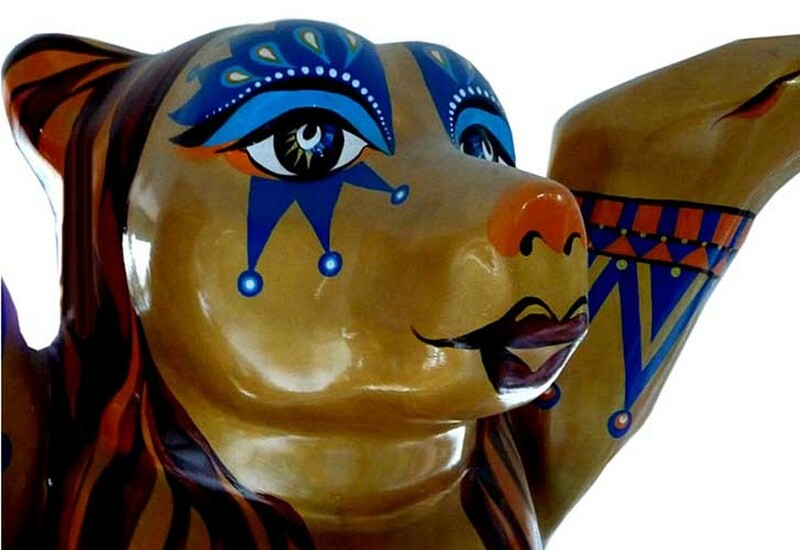 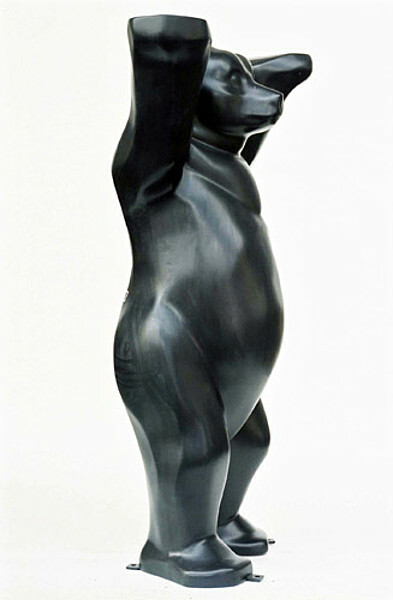 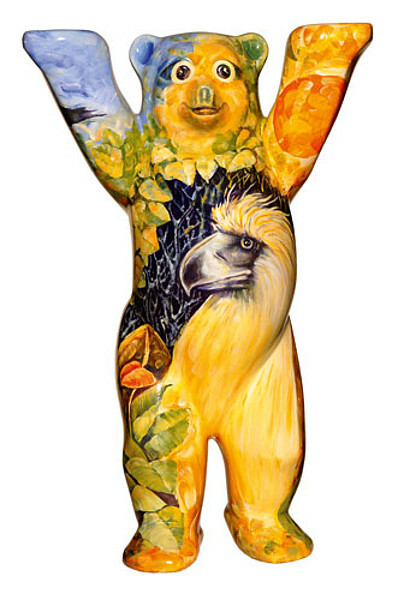 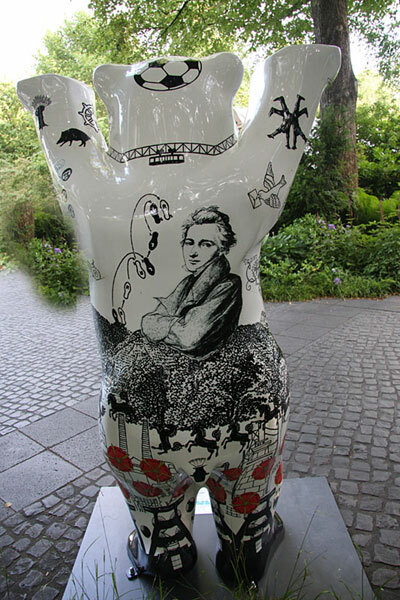 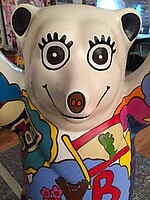 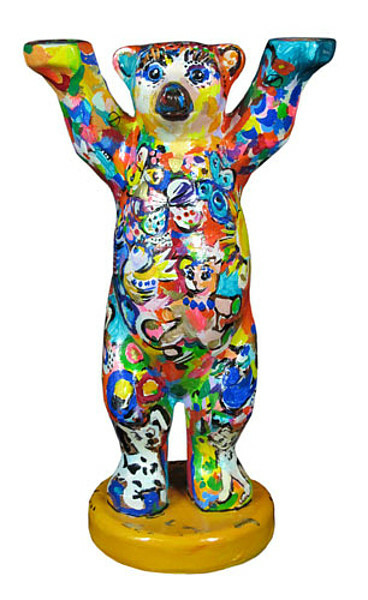 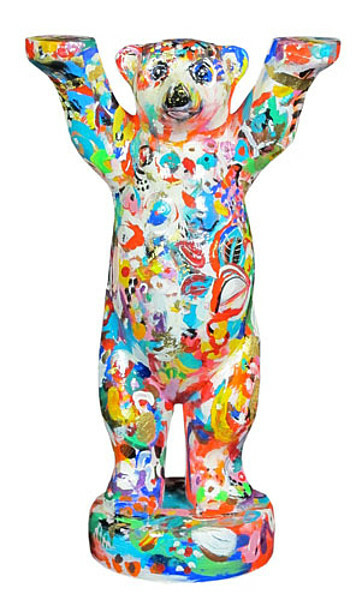 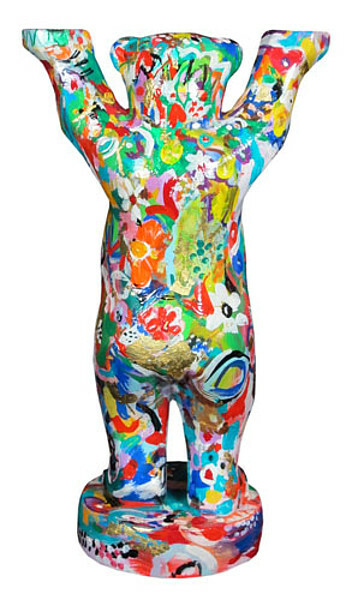 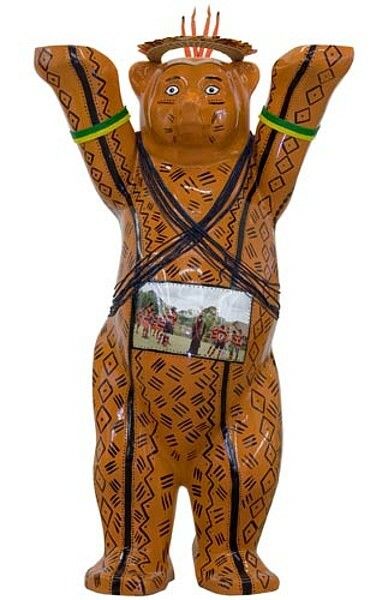 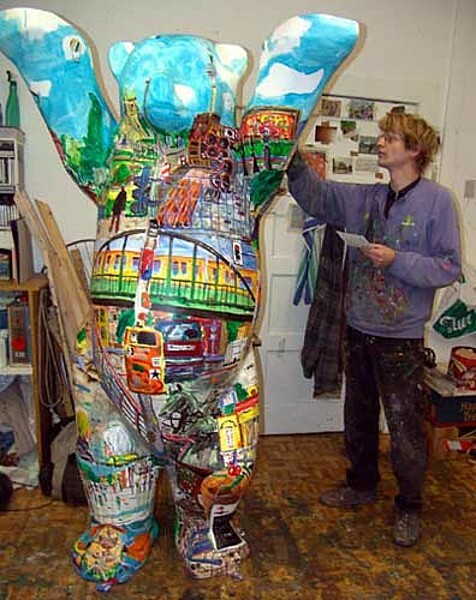 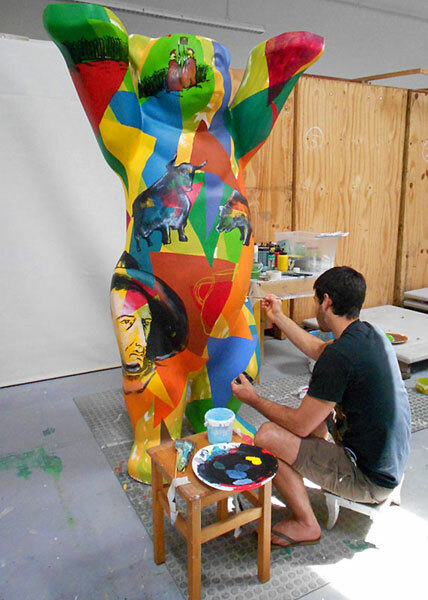 Further information on the artists and the creation of the bear. 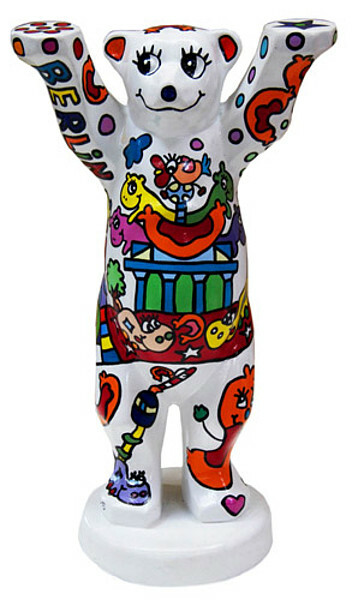 Object 2m - 3 "Herz im Kopf"
This bear was part of the first circle of United Buddy Bears in Berlin, next to the Brandenburg Gate. 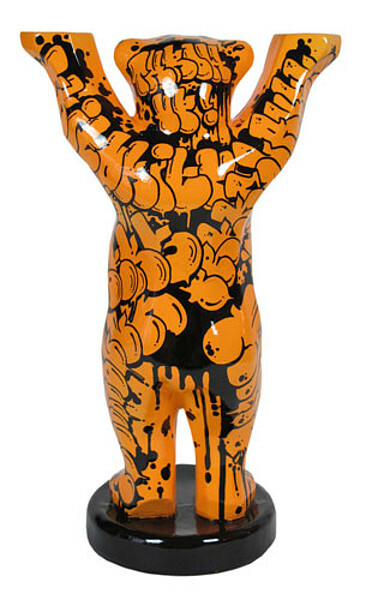 Round about 1.5 Mio. 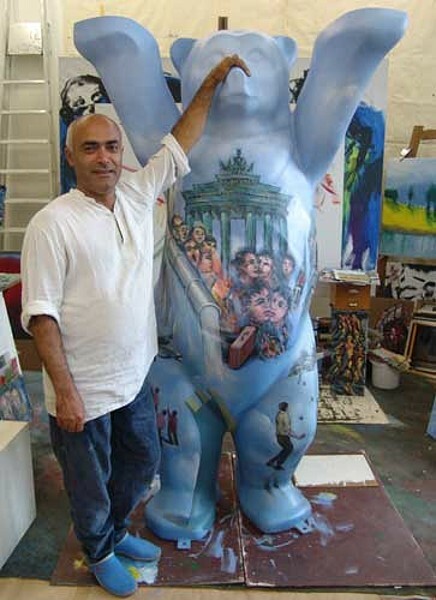 visitors came to see the first exhibition („The Art of Tolerance“) in 2002. 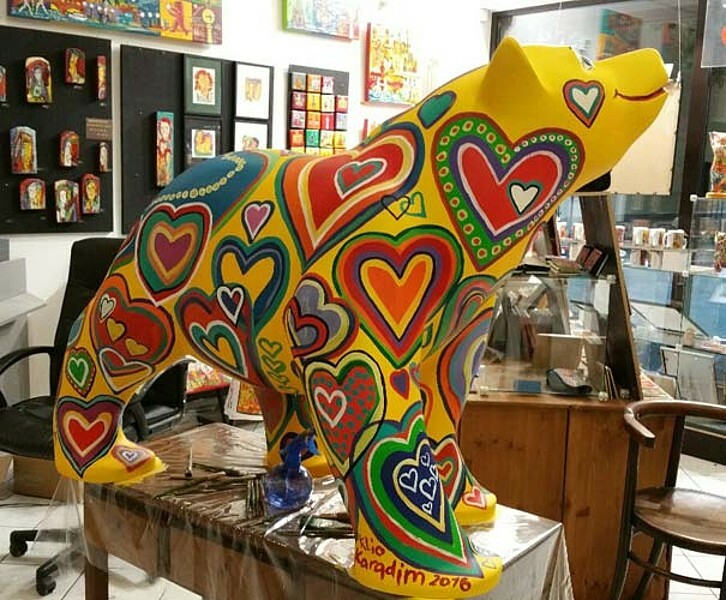 More information on the bear. 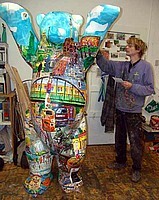 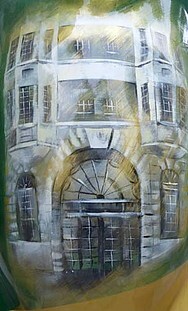 Further information on the artist. 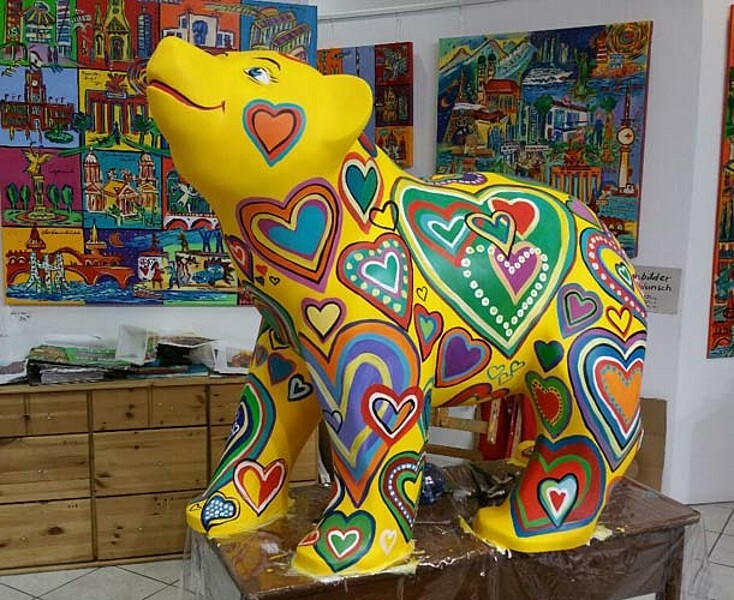 Object 2m - 4 "Sonnenrad"
This bear was shown at the exhibitions in Berlin, Kitzbühel, Hong Kong, Istanbul, Tokyo, Seoul, Sydney, Vienna, Cairo, Jerusalem, Warsaw, Helsinki, and Sofia. 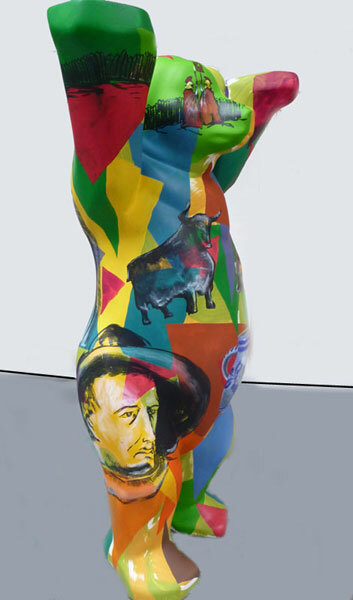 Object 2m - 5 "Indianer Bär"
This bear stood as an ambassador of Brasil in 14 of the 30 exhibition of the United Buddy Bears til today. 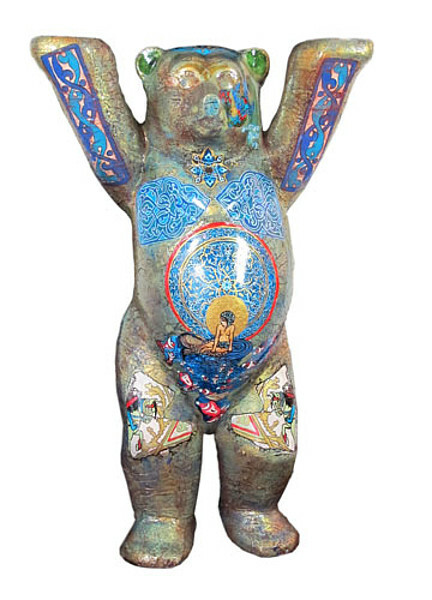 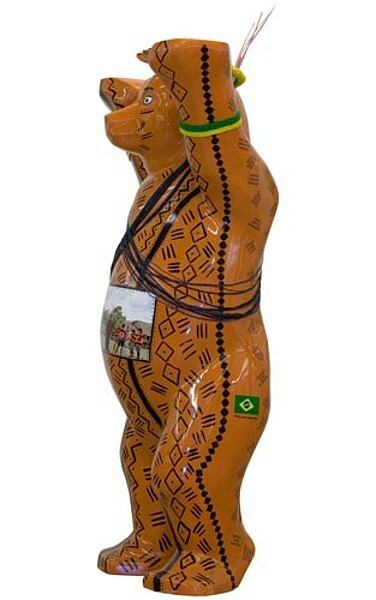 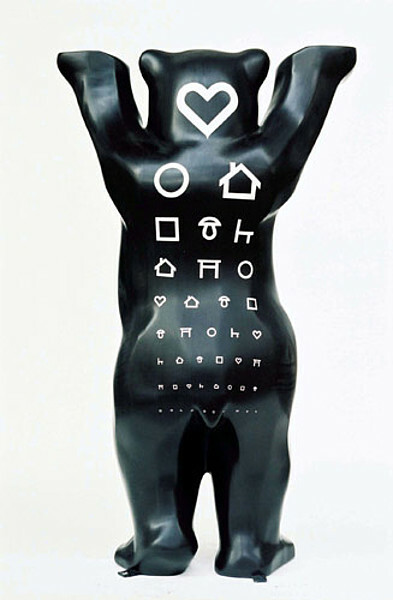 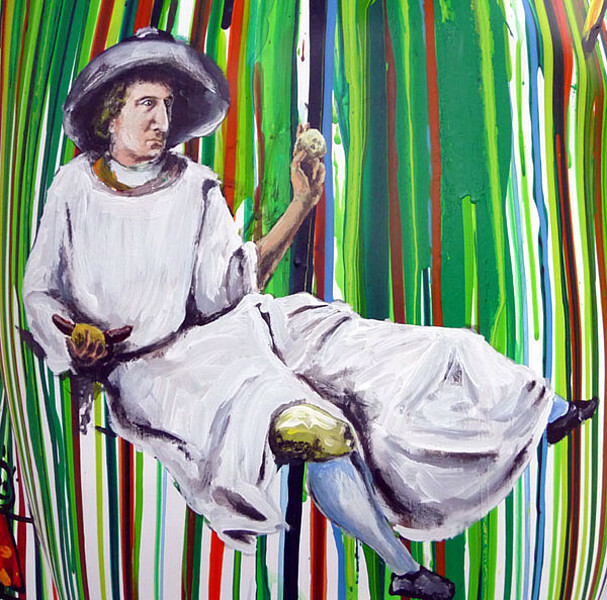 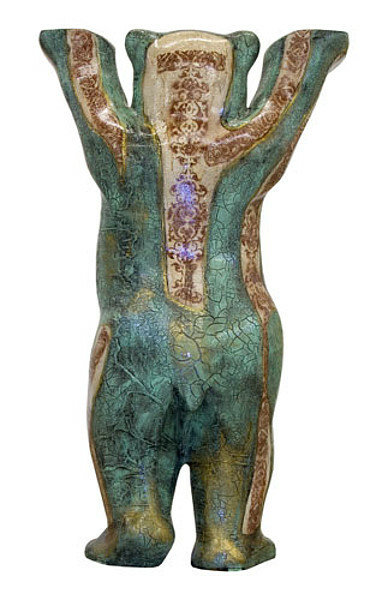 He was part of the exhibtion in Berlin, Vienna, Cairo, Jerusalem, Warsaw, Stuttgart, Buenos Aires, Montevideo, Astana, Helsinki, Sofia, New Delhi, St. Petersburg, and Paris. 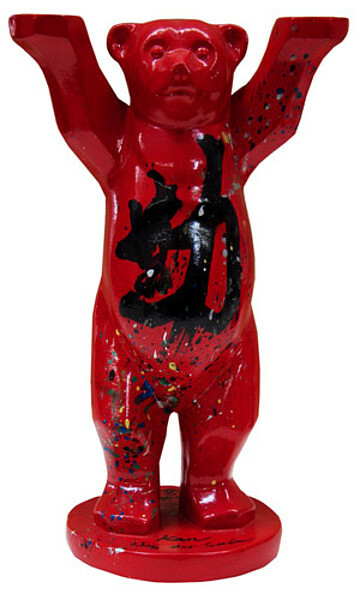 Object 2m - 6 "Kurfürstendamm"
The proceeds go to Berliner helfen e.V. 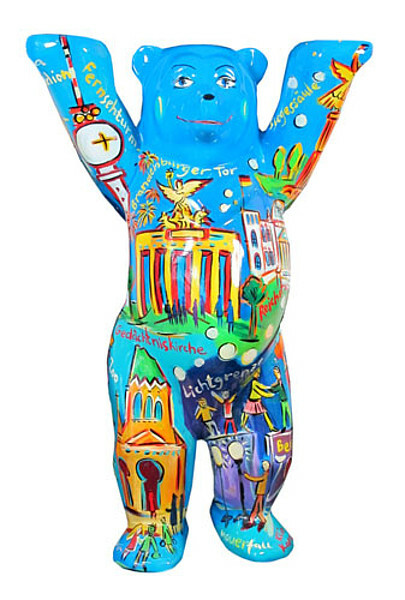 Object 2m - 7 "Berlin No. 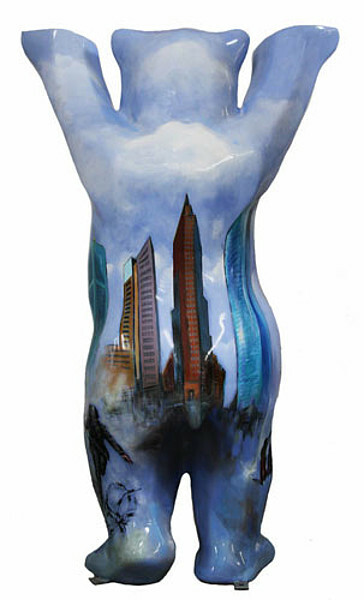 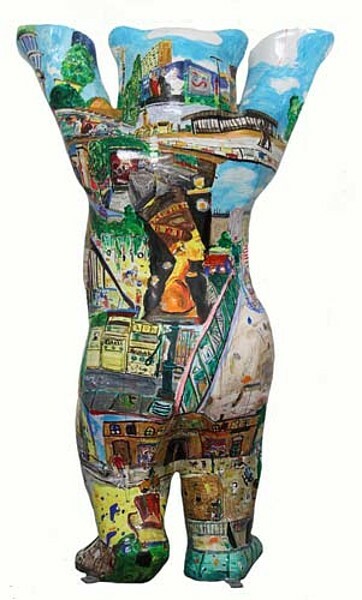 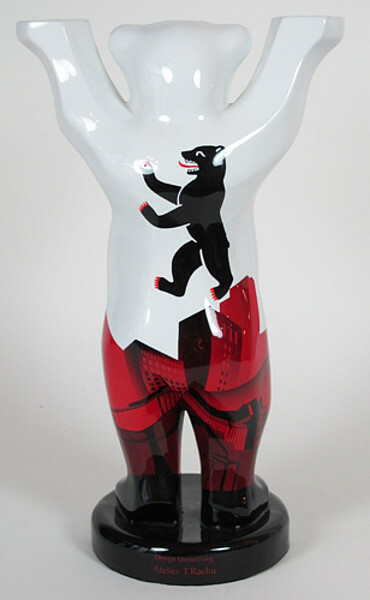 III"
Object 2m - 8 "Berlin Himmelblau"
Object 2m - 9 "Berlin History"
The proceeds go to Menschen helfen! 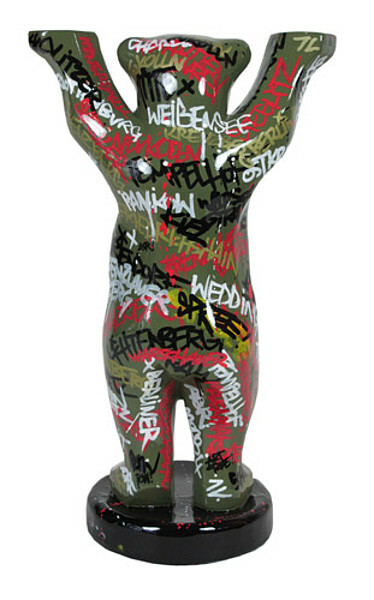 Object 2m - 10 "Schamanin"
The proceeds go to Theo Tintenklecks/my Theo e.V. 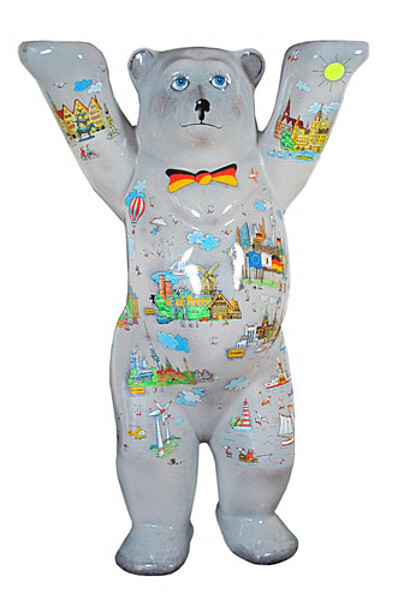 Object 2m - 11 "Berliner Farben"
Object 2m - 12 "Splitter"
Background information on the bear. The proceeds go to DKJS. 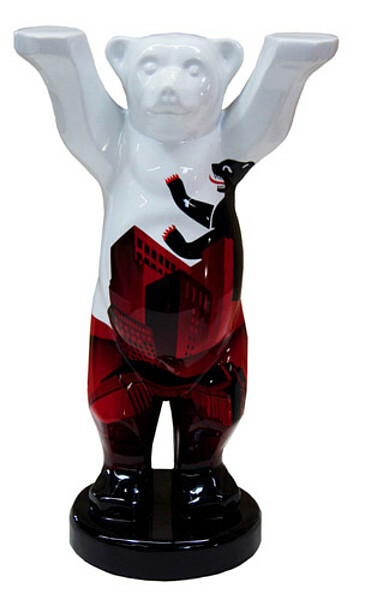 Object 2m - 13 "Phänomen Farbe"
Object 2m - 14 "Ross & Rose"
The lowest bid for a 1m tall Buddy Bear was 850 €. 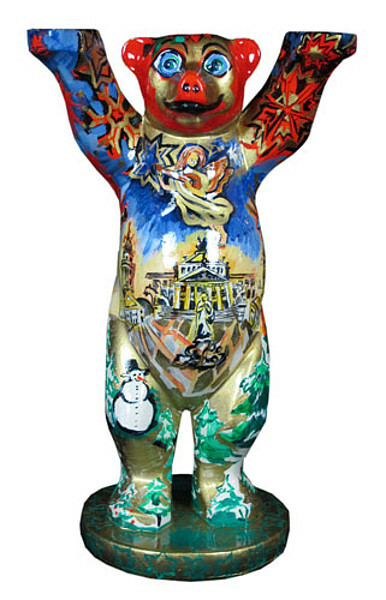 Object 1m - 1 "Kind der Sonne"
Object 1m -2 "Zauber des Orients"
Object 1m - 4 "Eagle"
More information about the bear. 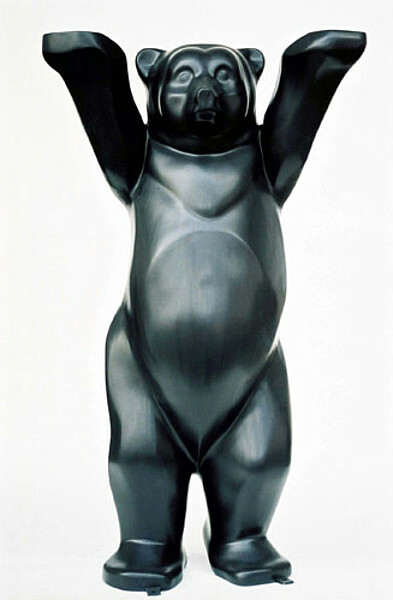 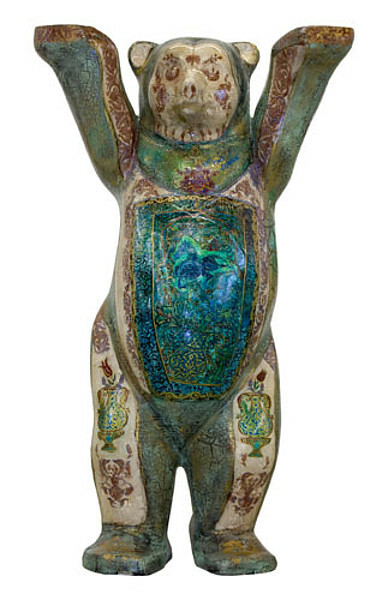 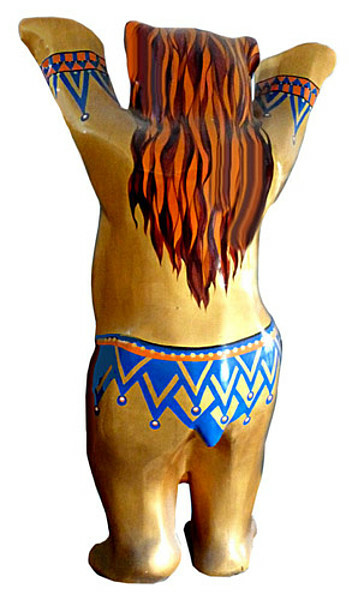 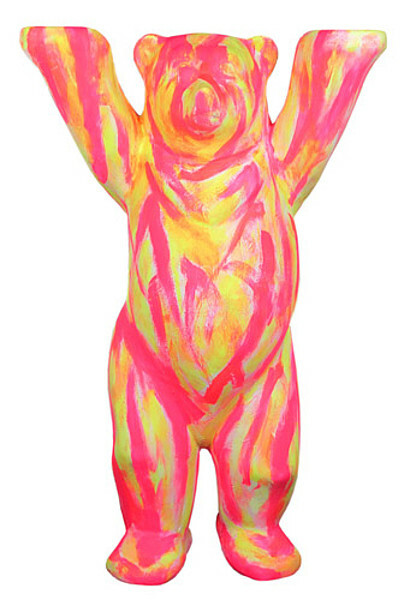 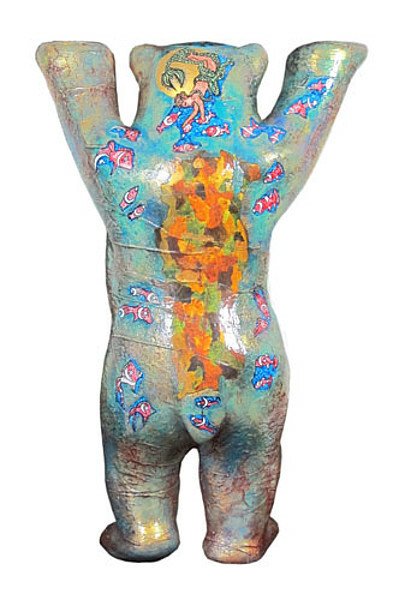 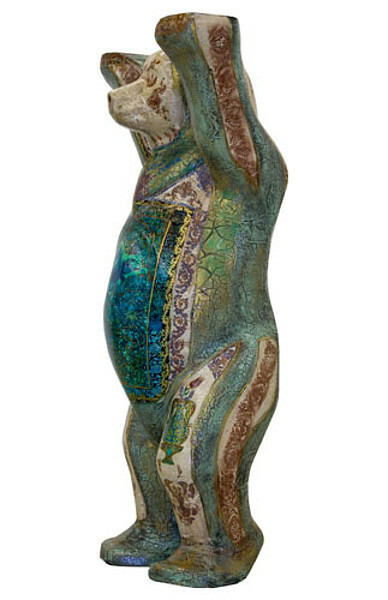 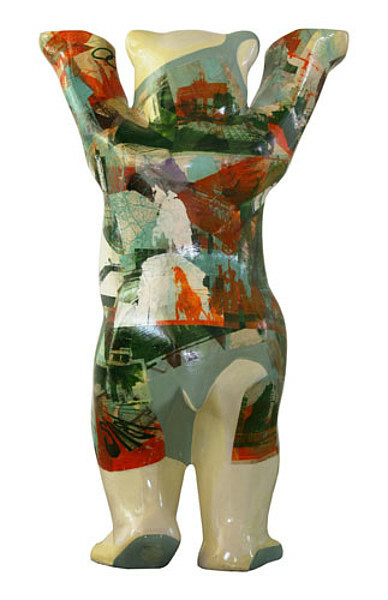 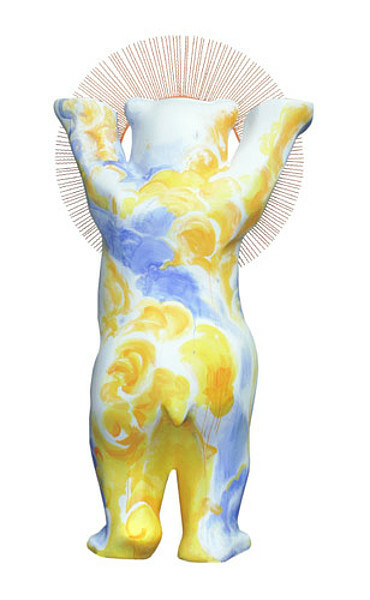 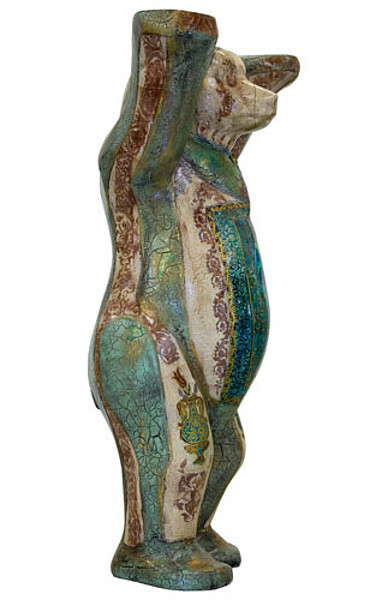 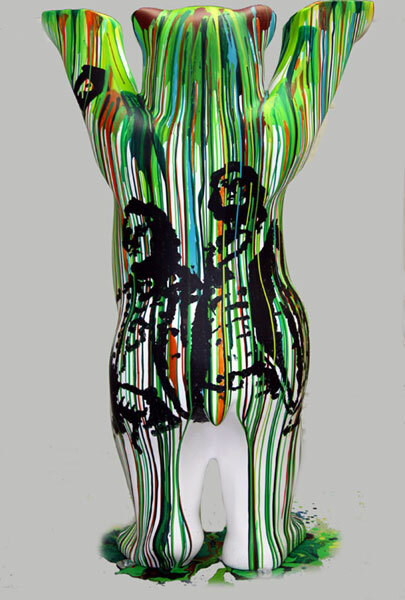 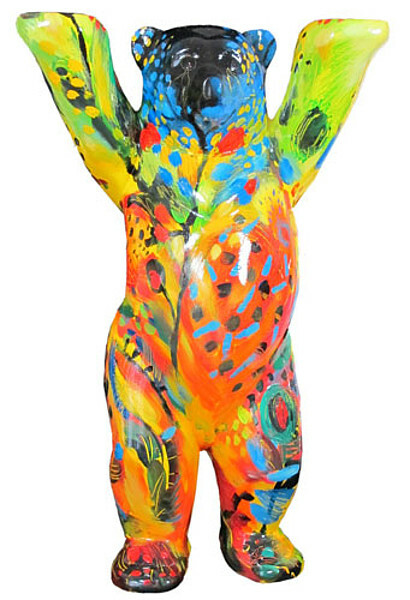 Object 1m - 5 "Twin Bear Boy"
More about the art of Sabeth Holland and her Twin Bears. 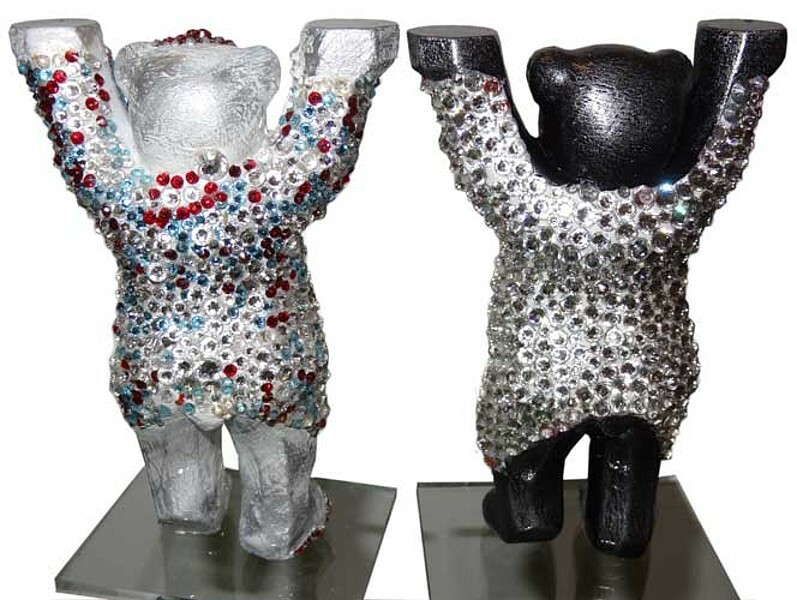 The proceeds go to Buddy Bear Help e.V. 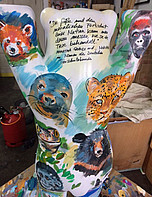 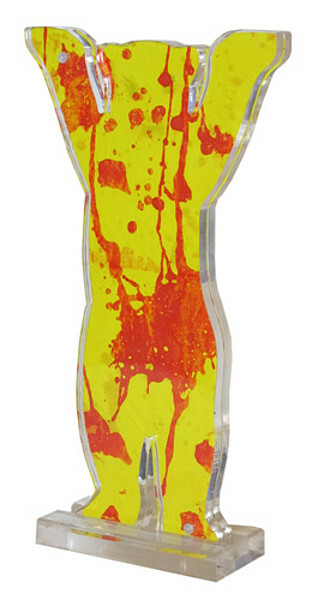 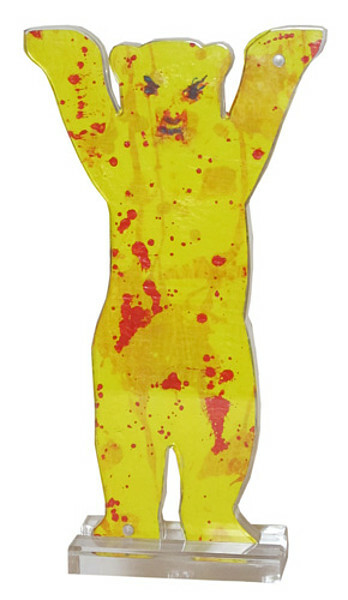 Object 1m - 7 "Bilderbogen Deutschland"
The proceeds go to Zentrum für trauernde Kinder und Familien Berlin Brandenburg e.V. 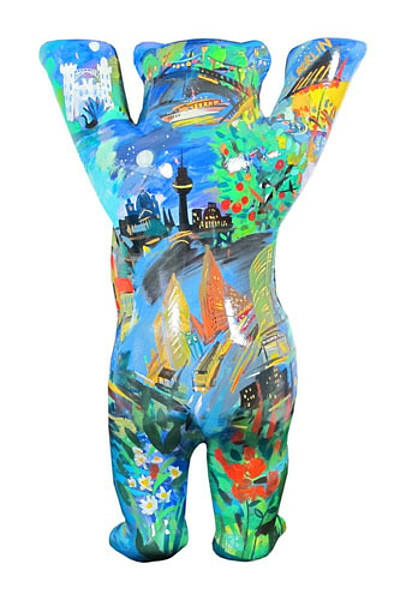 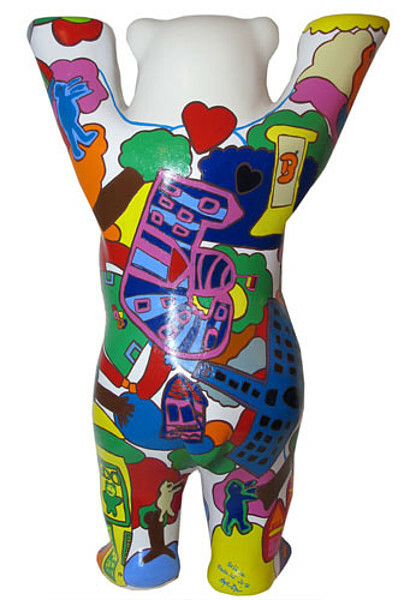 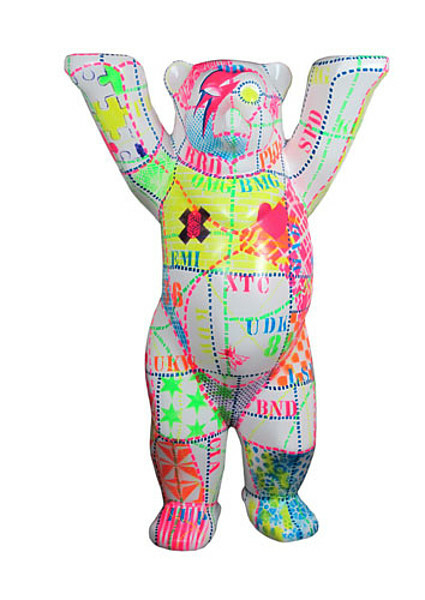 Object 1m - 8 "Meeting Place"
Object 1m - 9 "Rendezvous in Berlin"
Object 1m - 10 "Sportstadt Berlin"
Object 1m - 11"Kant meets Pop art"
Object 1m - 12 "Arnold"
Object 1m - 13 "Glaube, Liebe, Hoffe"
The proceeds go to one of SOS-Kinderdörfer weltweit in Senegal. 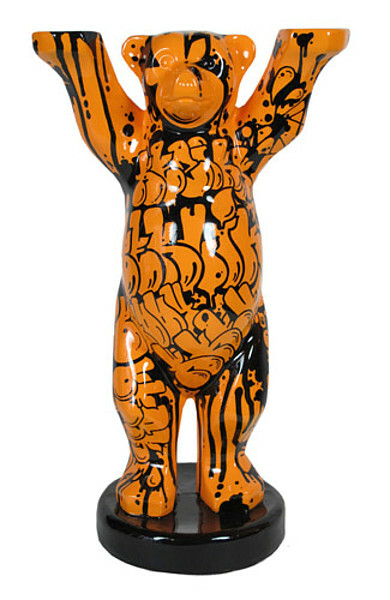 Object 1m - 14 "Carlito"
Pictures of the bear will follow soon. Object 1m - 15 "Herzen"
Object 1m - 16 "Azadeh"
Azadeh is a female name and means free thinker. Object 1m - 17 "Divercity"
Object 1m - 18 "Wowi"
The lowest bid for a Buddy Bear Miniature was 200 €. 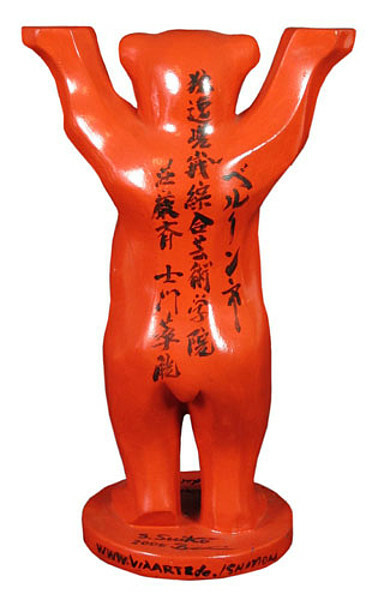 Object 33cm - 1 "Lucky One"
The proceeds go to Buddy Bear Help. 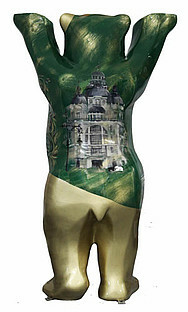 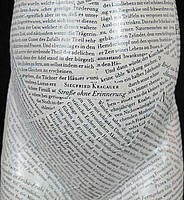 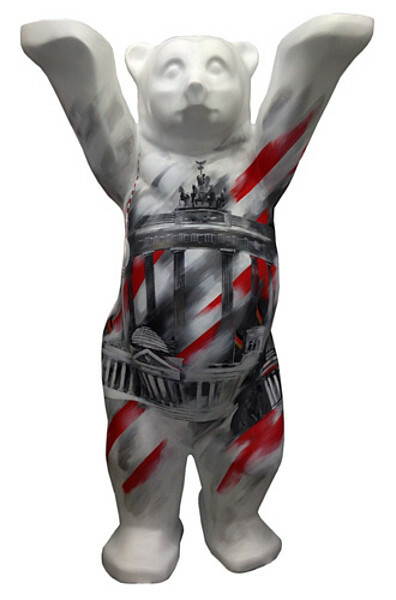 Object 33cm - 2 "Berliner Schloss"
Object 33cm - 3 "Weg der Seele"
Object 33cm - 4 "Brandenburg Gate"
Object 33cm - 5 "Urban Art, District I"
CARLOS is a Spanish street art and tattoo artist, who lives in Berlin. 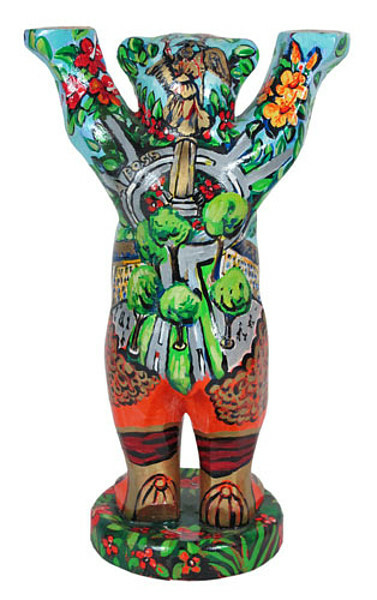 Object 33cm - 6 "Urban Art, District II"
Object 33cm - 7 "Currywurst Berlin"
Object 33cm - 8 "Rocklegenden City"
Object 33cm - 9 "Rocklegenden Karat"
Object 33cm - 10 "Rocklegenden Puhdys"
Object 33cm - 11 "Lesebär"
Object 33cm - 12 "Elektropolis"
Object 33cm - 13 "Weihnachtszauber"
Object 33cm - 14 "Oso paseando con sus amigos"
Object 33cm - 15 "Matt the Polar Dancer"
The lowest bid for this bridal couple was 200 €. 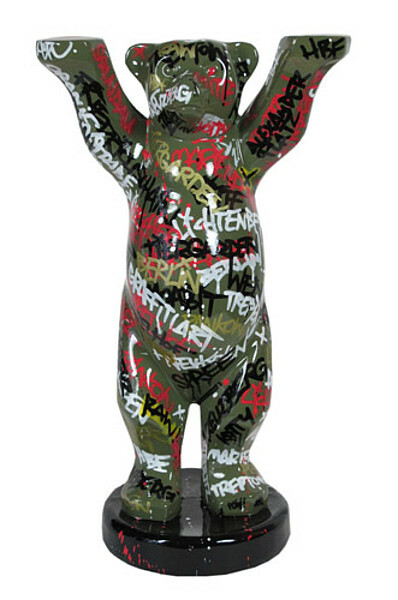 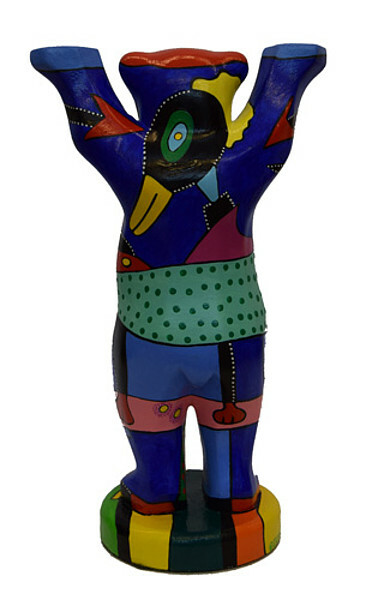 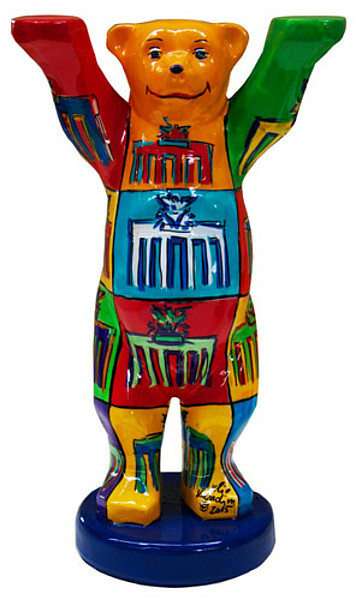 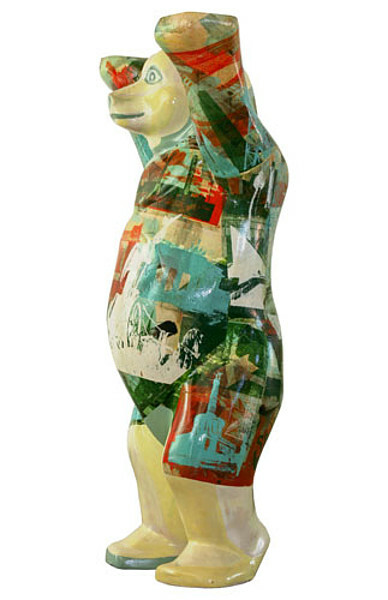 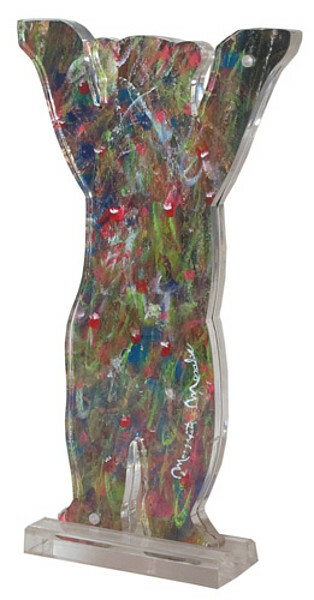 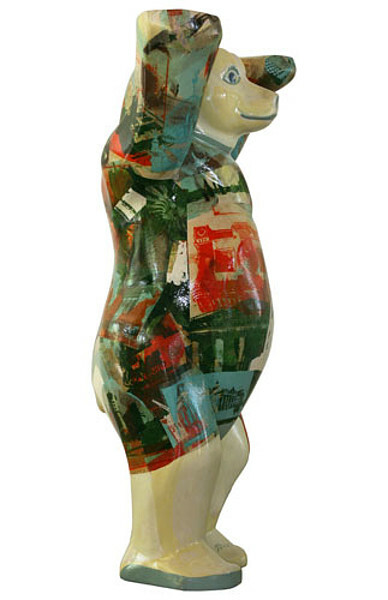 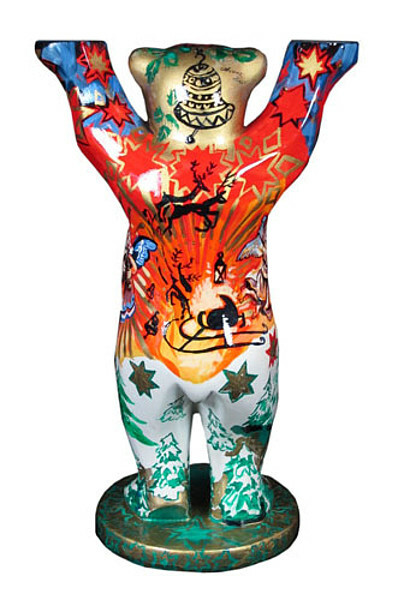 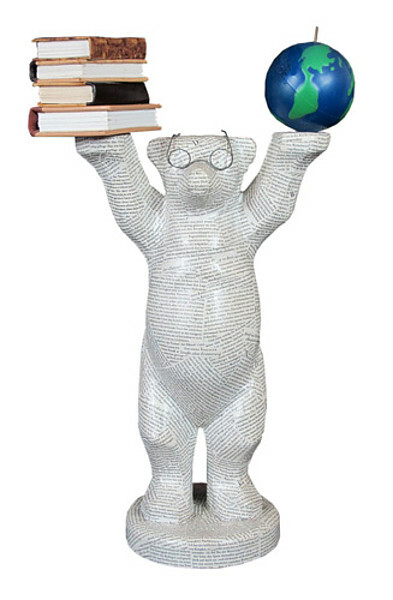 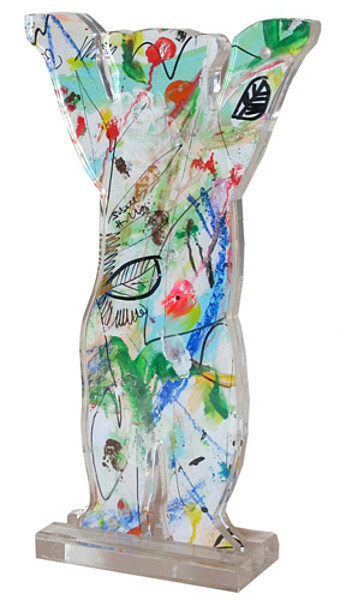 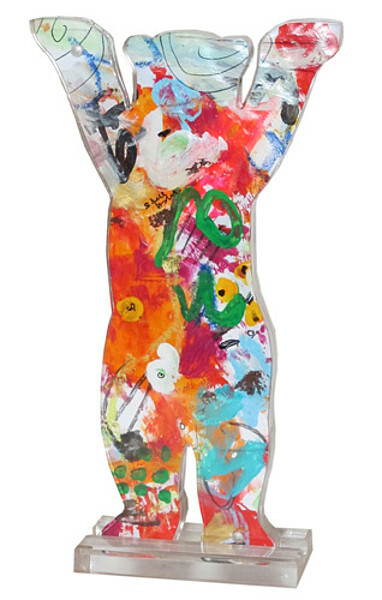 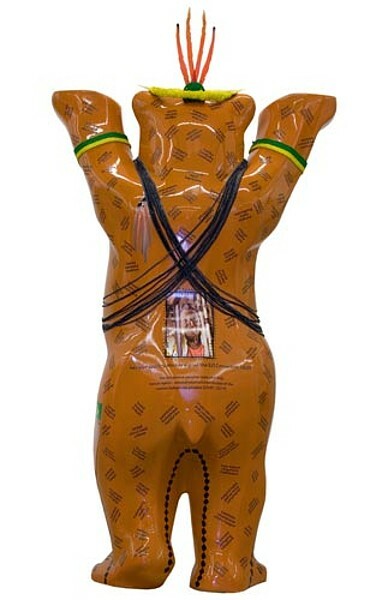 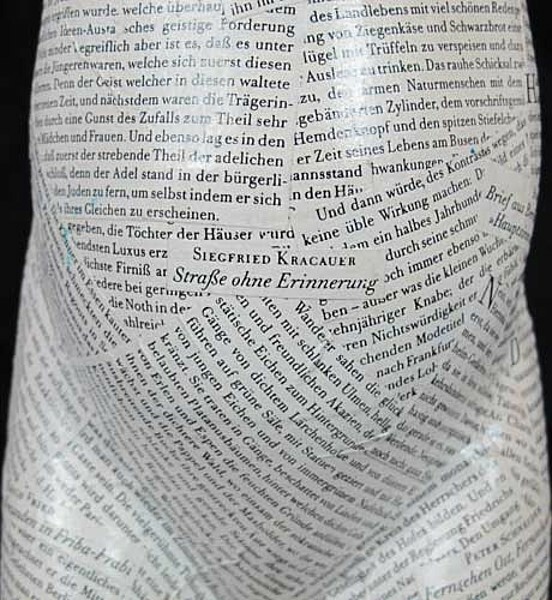 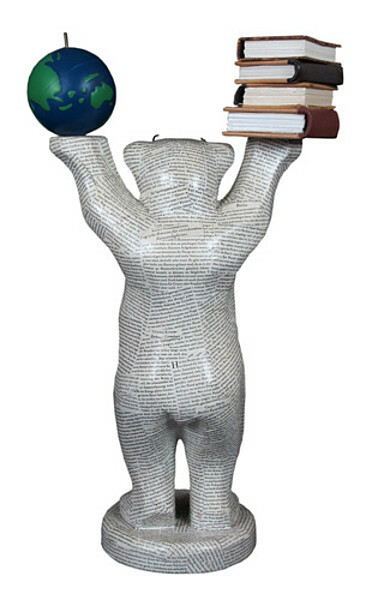 Object 12 cm - 1 "Hochzeitspaar"
The lowest bid for a 2D Buddy Bear was 200 €. 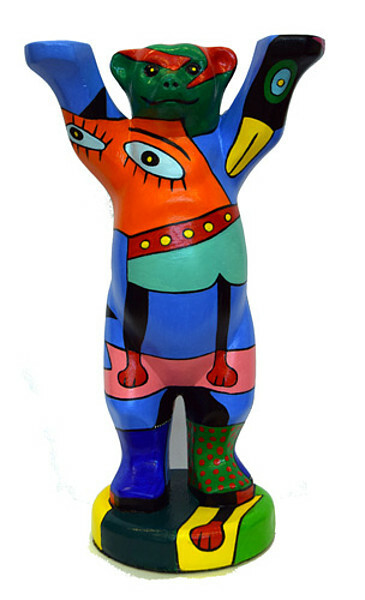 Object 2D - 1 "The First"
Object 2D - 2 "Margarita"
Object 2D - 3 "Lux"